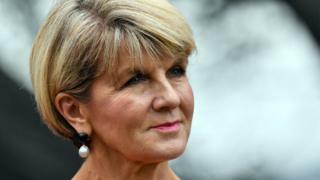 Australia's former foreign minister, Julie Bishop, has accused her parliamentary colleagues of "appalling behaviour" that would not be acceptable "in any other workplace". Australia's parliament has been hit by allegations of bullying and intimidation of women in recent weeks. The debate escalated amid a party coup which toppled Malcolm Turnbull as PM. Ms Bishop, who ran unsuccessfully to be his successor, said political parties had "a problem" with keeping women MPs. Ms Bishop was the most senior woman in the government until her resignation as foreign minister last week. "I have seen and witnessed and experienced some appalling behaviour in parliament," she said in a speech late on Wednesday. "It is evident that there is an acceptance of a level of behaviour in Canberra that would not be tolerated in any other workplace across Australia." She did not detail examples. However, her comments come amid allegations that female government MPs were intimidated by male colleagues during the leadership turmoil. Last week, Prime Minister Scott Morrison said he had "laid down the law" to his ministers that intimidation was unacceptable. Government lawmakers Julia Banks and Lucy Gichuhi have also raised allegations of bullying within the government. Ms Banks has revealed her intention to quit parliament, while Ms Gichuhi has threatened to use parliamentary privilege to name alleged offenders. Ms Bishop said: "If a feisty amazing woman like [Julia Banks] says this is not the right environment for me, people should not be saying 'toughen up princess' - but rather 'enough is enough'." She said it was unacceptable that less than a quarter of MPs in her party were women.